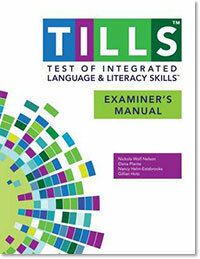 The TILLS is composed of 15 subtests that allow examiners to assess and compare students language-literacy skills at both the sound/word level and the sentence/ discourse level across the four oral and written modalitieslistening, speaking, reading, and writing. The TILLS can be used flexibly administer a single subtest, a combination of subtests, or the entire test. The TILLS Student Language Scale allows students, parents, and teachers to rate how well a student performs on academic tasks. The TILLS was standardized on a representative sample of 1262 children and adolescents. Identification core subtests can be administered in only 25-45 minutes, and a comprehensive assessment can typically be administered in 90 minutes or less. Raw scores are converted to standard scores and Composite standard scores. Cut scores indicate whether the students score is consistent with the presence of a language/literacy disorder. McDonalds Omega values for subtests ranged from 0.95 to 0.99. Test-restest correlations for subtests ranged from 0.71 to 0.99. Inter-rater reliability correlations ranged from 0.84 to 0.99. Validity studies demonstrated that the TILLS is able to differentiate typically developing individuals from those at risk for, or diagnosed with, a language or literacy disorder. TILLS subtests scores correlate significantly with other commonly used language and literacy assessments.